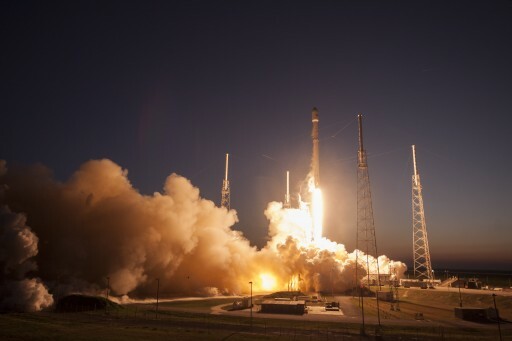 Coming after multiple delays, this flight to a high-energy Supersynchronous Transfer Orbit with a heavy payload demanded the entire performance of the Full Thrust version of the Falcon 9 in a flight with very tight fuel margins. 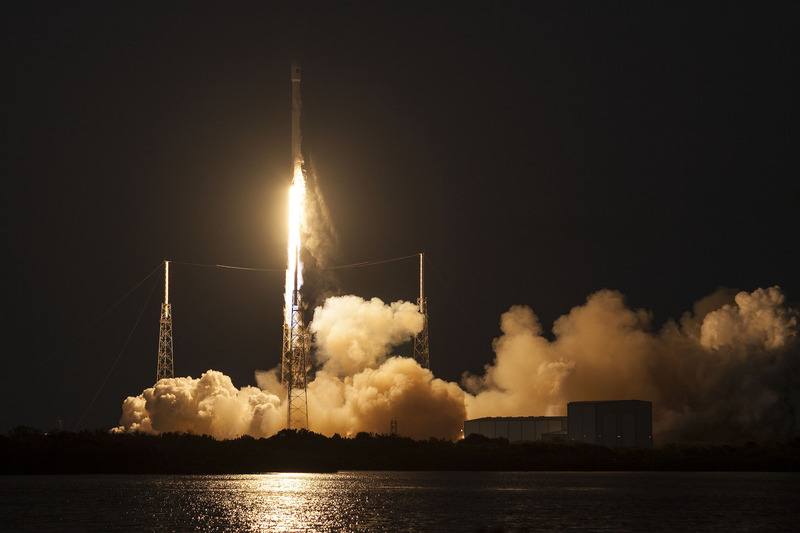 The Falcon 9 carrying the 5,300-Kilogram satellite leapt off its launch pad at Cape Canaveral Air Force Station at 23:35 UTC, thundering into the twilight sky with a thrust of nearly 700 metric-ton-force and guzzling down 2,500 Kilograms of supercold propellants every second. The first stage fired for just over two and a half minutes before handing over to the MVac engine of the second stage that completed two burns – first placing the stack into a Low Earth Parking Orbit followed by a second burn that was programmed to use up the entire propellant reserve of the second stage to boost the satellite into as high an orbit as possible. SES-9 was sent on its way 32 minutes after liftoff into its target orbit. After sending the second stage on its way, the Falcon 9 booster went through the motions to fly itself to the Autonomous Spaceport Drone Ship, stationed 660 Kilometers from the SLC-40 launch pad. 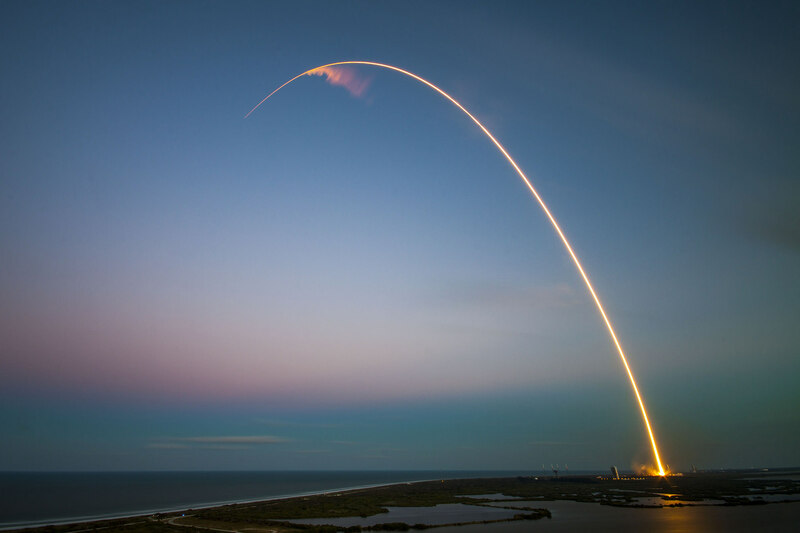 Sending a satellite to a high-energy trajectory created a particularly extreme re-entry environment for the first stage since not enough propellant was left to slow the stage down, let alone flying it back to the Space Coast. 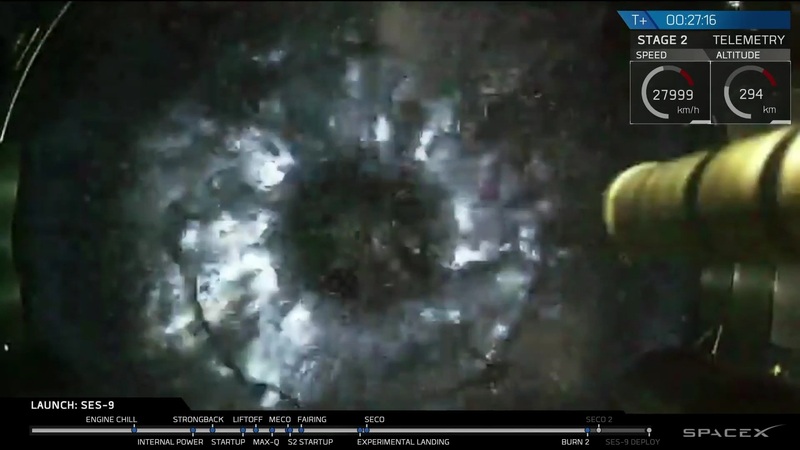 The booster was successful in surviving the re-entry and maneuvered to the Drone Ship, firing its engines for its landing burn, but appeared to come in off-center before video from the drone ship was lost. 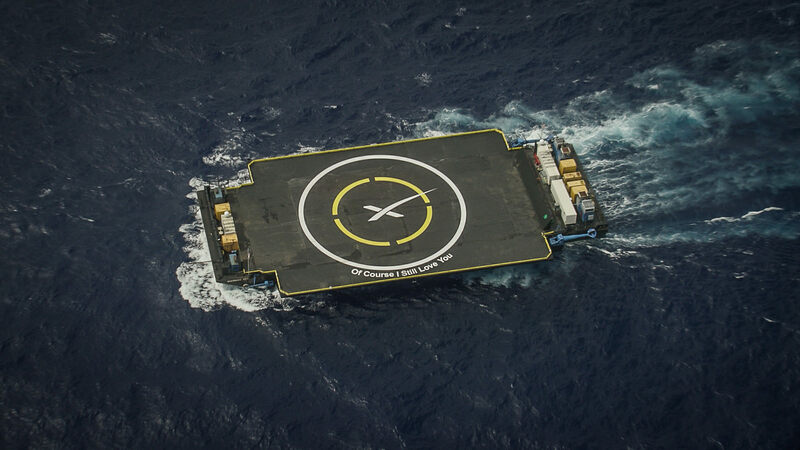 SpaceX CEO Elon Musk confirmed that the first stage made a hard landing on the Drone Ship in another close call of achieving SpaceX’s first landing at sea. For SES-9, Friday’s liftoff came after a very long road to the launch pad, slowed down by last June’s Falcon 9 launch failure, leading to a half-year stand down at SpaceX. Initially, SES-9 was first on the SpaceX manifest, set to ride the return to flight mission coinciding with the debut of the Falcon 9 Full Thrust variant, however, plans were changed and Orbcomm became first on the firing line to allow for an opportunity of an in-space re-start test of the modified MVac second stage engine before relying on a clean re-ignition to deliver a satellite to orbit. SES initially aimed for launch in the fourth quarter of 2015 and the company’s 2016 revenue forecast included substantial revenue generated from the commercial operation of SES-9. Some pressure was added when the launch of Falcon 9 slipped from a January target into February with additional days of delay from last into this week when Falcon 9 encountered launch scrubs due to trouble with the intricacies of its sub-cooled Liquid Oxygen propellant. This week, the vehicle was kept on the ground by strong upper level winds over Cape Canaveral, also threatening Friday’s launch opportunity. In order to keep the original in-service schedule for the satellite, SpaceX accommodated a request by SES to change the mission profile in order to boost the satellite closer to its operational orbit. The SES-9 satellite hosts an all Ku-Band payload comprised of 57 high-power transponders, equivalent to 81 standard 36MHz transponders. 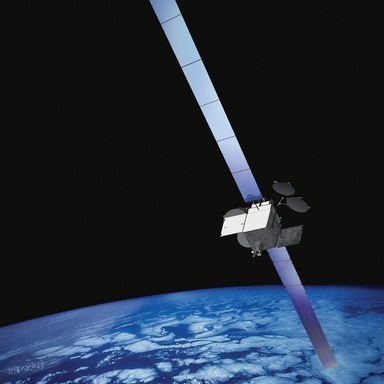 Reaching Geostationary Orbit, the satellite will be located at 108.2°E to deliver a variety of services to up to 23 million households in the Asia-Pacific Region, serving rapidly expanding TV markets and delivering data, video and mobile communications services. SES-9 also provides mobile communications services with seamless coverage across frequented aeronautical and maritime traffic routes across the Indian Ocean. 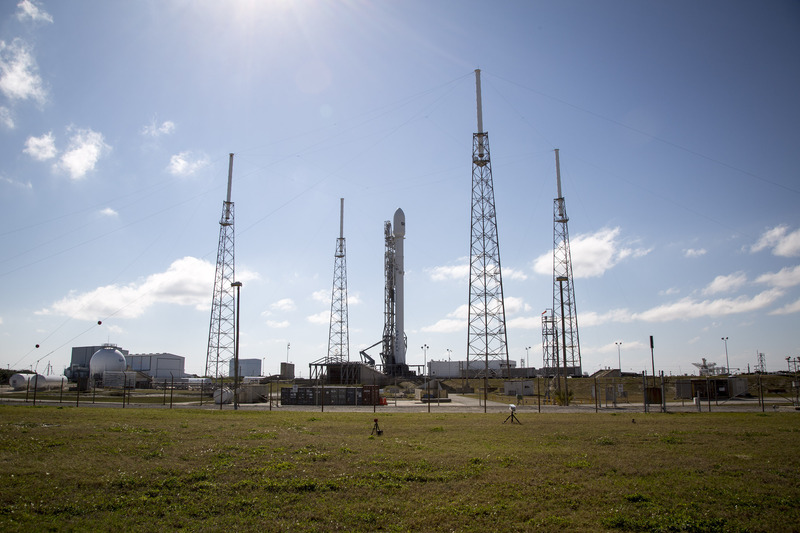 Friday’s multi-hour countdown was initiated with the activation of the Falcon 9 rocket for an extensive set of checkouts and reconfigurations. While Falcon 9 was going through electrical, communications and flight control checks, teams at the pad finished closing out the base of the rocket and all ground facilities before clearing the complex. 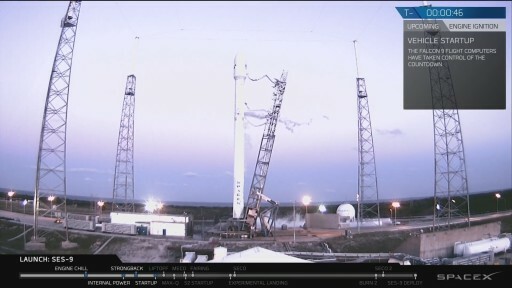 Range controllers started watching over the launch corridor and range tracking instruments beginning at T-4 hours. Given the compressed timeline with fueling only in the last hour of the count, all tests were completed well beforehand and awarded the Falcon 9 a clean bill of health. 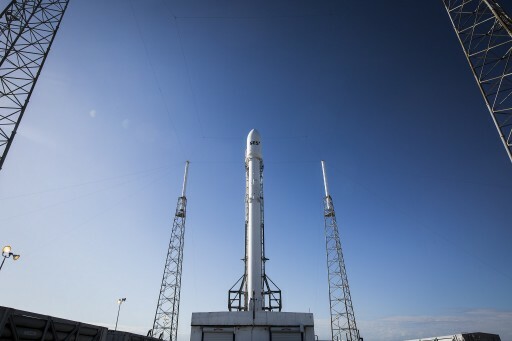 The Launch Team went through polling at T-35 minutes and all stations reported readiness for the expedited fueling sequence employed by the Falcon 9 FT rocket. Starting at T-32 minutes, supercold propellants began flowing into the two stages of the vehicle after putting the tanks through a chilldown. Over 500 metric tons of sub-cooled Liquid Oxygen at -207°C and Rocket Propellant 1 chilled to -7°C were loaded into the two stages of the rocket in a sequence leaving no margin for error as fueling was set up to close out just minutes before launch. The challenge brought on by the use of densified propellants is achieving a predictable and repeatable thermal configuration within the tanks to ensure both stages are at the proper launch mass when T-0 arrives. As sub-cooled LOX is loaded into the vehicle, it warms up and thermal/density gradients arise within the tanks which can be troublesome for a high-performance mission like this. No issues occurred at any point and the countdown entered its Automated Sequence, all while the tanks were still in the process of being filled, a task most rockets finish with minutes or even hours to spare, but not Falcon 9. Liquid Oxygen loading reached flight level just around three minutes ahead of launch, in time for the pressurization of the tanks to allow the large Strongback structure to retract and clear the way for the rocket. Getting close to ignition, Falcon 9 finished the chilldown of its nine engines, transferred to internal power and assumed control of the countdown for the final pressurization of tanks ahead of the commands to ignite the engines, issued at T-3 seconds. The characteristic green flames of Falcon’s igniter mixture erupted from the engines as turbopumps spun up and combustion was triggered within the nine engine chambers. Falcon 9 lifted off at precisely 23:35 UTC with a total thrust of 694 metric-ton-force, rising vertically from its pad to clear the lightning towers before initiating its pitch kick and roll maneuver to begin its journey to the south-east. Lighting up the twilight skies over the Space Coast, Falcon 9 aligned itself with its planned flight path, accelerating through Mach 1 just over a minute into the flight and experiencing Maximum Dynamic Pressure 80 seconds after leaving the ground. With launch shortly after sunset, Falcon 9 quickly flew into daylight creating a spectacular sight for those watching from the ground. Passing T+2 minutes, Falcon 9 was sufficiently high in the sky for the Drone Ship to begin collecting telemetry and tracking data of the ascending vehicle. A short time later, the nine Merlin 1D engines began throttling down to limit acceleration on the launcher as it approached main engine cutoff. The first stage shut down is engines two minutes and 36 seconds into the flight, having accelerated the vehicle to a speed of Mach 6.8. Four seconds after MECO, the first stage separated with the help of four pneumatic pushers, clearing the larger engine bell of the new MVac engine. After the first stage pulled away, the MVac engine was commanded to ignite around T+2 minutes and 47 seconds into the flight, soaring to a maximum vacuum thrust of 95,300 Kilogram-force to boost the stack into orbit. The first burn of the second stage had a planned duration of six minutes and 14 seconds to lift the vehicle into a Parking Orbit a little over 200 Kilometers in altitude. Although the high-speed delivery of SES-9 was the primary objective of the mission, all eyes were on the first stage as it yet again embarked on a daring return to attempt a landing on the Autonomous Spaceport Drone Ship “Of Course I Still Love You” on station in the Atlantic Ocean, 660 Kilometers from the launch site. As a mission aiming for a high-energy orbit, this flight required the first stage’s entire performance, only leaving a small fraction of propellant reserves and thus cutting the margins for the return to the Drone Ship. SpaceX had come close in a number of previous attempts of landing a booster on the Drone Ship including January’s West Coast Launch that saw the first stage making a perfect upright landing on the ASDS, but only with three legs after the fourth failed to lock in place leading to the stage slowly tipping over and bursting into flames. Friday’s mission was the first GTO launch to attempt a booster landing, leveraging the additional performance of the Falcon 9 FT version. Given the energy of the first stage at separation, there was no way of conducting a boost back to the launch site and the booster was faced with a more extreme re-entry environment than seen before. First for the booster was a quick maneuver out of the second stage plume ahead of flipping around to point its engines towards the direction of travel to get into the proper position for re-entry. 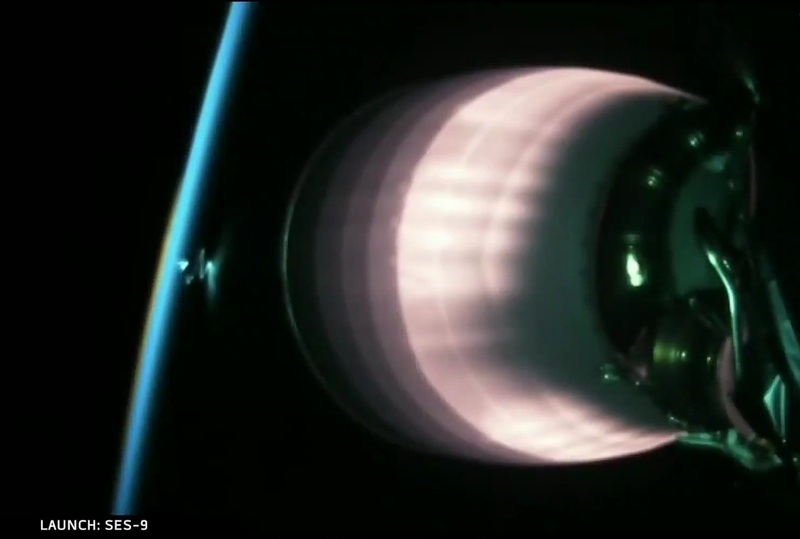 A short re-entry burn was conducted with three engines to shield the engine compartment from the extreme forces and temperatures occurring when dipping back into the dense atmosphere. Inbound for re-entry, the stage deployed its four grid-fins, each of which can be controlled along two degrees of freedom to be able to provide three-axis control once in the discernible atmosphere. The fins are an essential part in achieving the accuracy needed to guide the booster back to a landing site as the engines can not deliver the amount of maneuvering during their short periods of operation. Falcon 9 employed its grid fins and state of the art guidance platform to modify the booster’s angle of attack to control the downrange travel distance and to correct any cross-track errors to place the stage close to its intended landing burn target. Speeding towards the Ocean, the Falcon 9 booster re-ignited on its most complex landing burn yet – involving multiple engines to slow the booster down for landing. 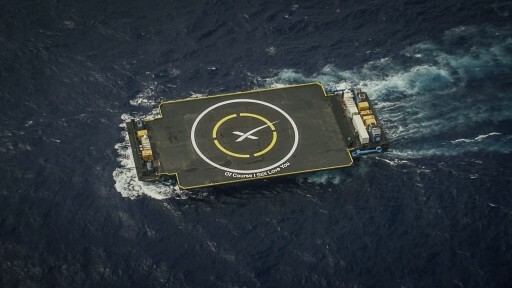 The engines were tasked with some heavy throttling and gimbaling action to put the rocket stage into a vertical descent towards the prominent SpaceX logo painted on the drone ship’s deck. 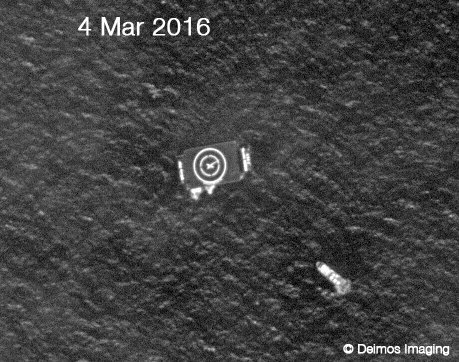 Video from the ASDS showed the first stage coming in off center before signals from the ASDS were lost before it made contact with the deck. Apparently, the booster made a hard landing and did not survive as was expected for this mission. The fact that the vehicle survived re-entry and was able to target the ASDS after atmospheric flight is very encouraging for future missions, demonstrating the robustness of the booster. While the first stage’s journey came to a dramatic end, a little over 200 Kilometers in altitude, the second stage finished its first burn by heading into Terminal Guidance Mode to achieve an on-target Parking Orbit, also deactivating the Flight Termination System. Just past T+9 minutes, the MVac engine shut down to mark the start of an 18-minute coast phase, reaching a good parking orbit at 160 by 531 Kilometers. The coast phase enabled the second stage to conduct its second burn when passing the equator so that the apogee of the insertion orbit would also be placed above the equator to ease the process of transferring the satellite to Geostationary Orbit. While coasting, the second stage performed pre-programmed attitude maneuvers and continued to send good telemetry data, reviewed in real time at the Cape and SpaceX Headquarters in Hawthorne. 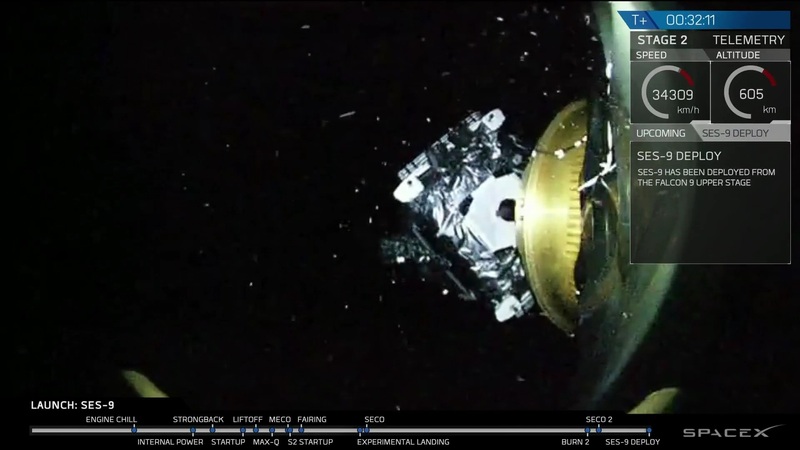 MVac made a clean re-start right at T+27 minutes for a modified burn to give SES-9 an extra boost to deliver it closer to its operational orbit in order to cut in half the time needed by the spacecraft to climb into Geostationary Orbit. The engine firing was set up to essentially burn the second stage to depletion, shutting the engine down when reaching a minimum propellant residuals level instead of relying on a guided shutdown based on more conservative simulations. 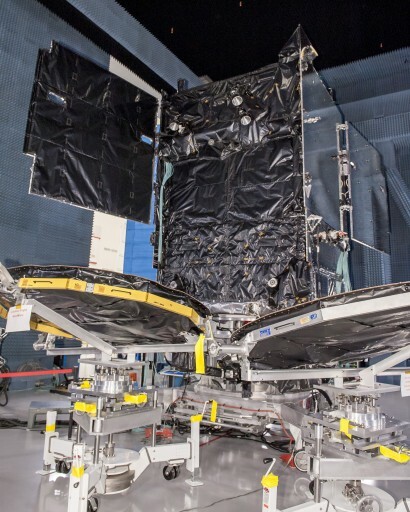 This mission modification was agreed upon by SpaceX and SES to keep the original in-service schedule for SES-9, despite the multi-week slip of the launch. 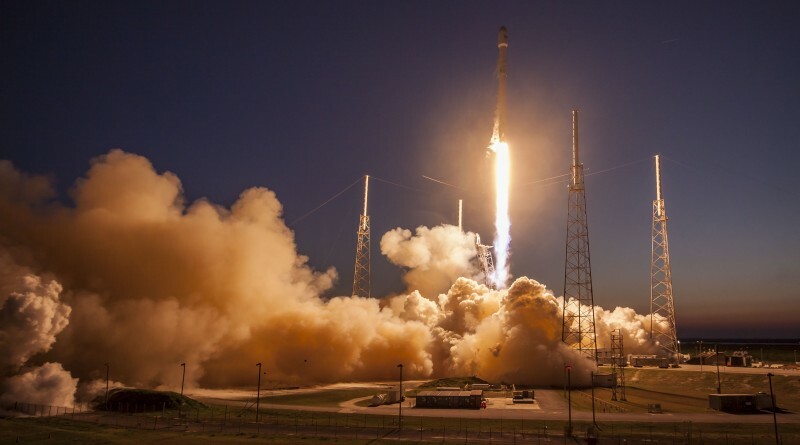 Originally, Falcon 9 was to deliver SES-9 to a sub-synchronous orbit with an apogee under 24,000 Kilometers in altitude from where it would have taken the satellite three months to enter its operational slot in Geostationary Orbit, 35,800 Kilometers over the equator. 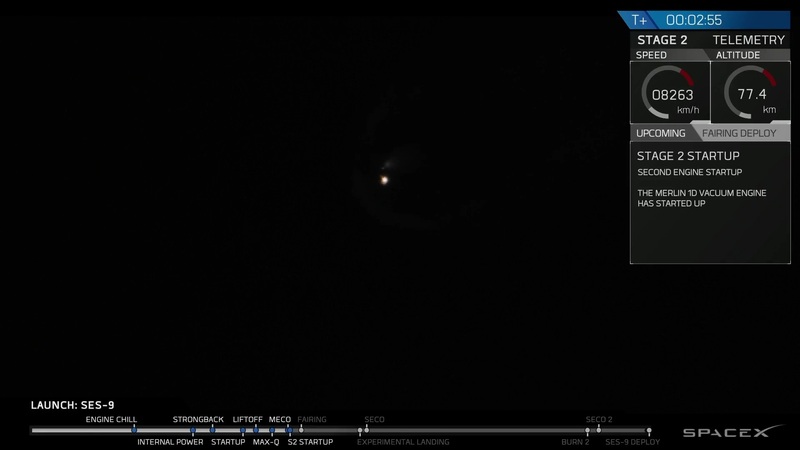 With the modified shutdown, a few extra seconds of burn time were expected from the second stage, enabling Falcon 9 to conduct a supersynchronous mission and drop the satellite off in an orbit with a much higher apogee, above the Geostationary Belt. SES-9 aimed for an insertion orbit of 290 x 39,300 Kilometers, inclined 28°, though the apogee altitude was depending on the performance of the second stage. Shutdown of the second stage was clean and set up for the separation of the SES-9 satellite three and a half minutes after SECO. 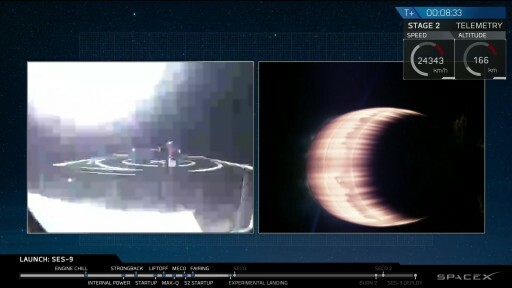 Elon Musk reported that Falcon 9 achieved an apogee of 40,600 Kilometers, indicating that the second stage exceeded expectations and delivered the satellite to a very good orbit, enabling it to reach GEO on time. 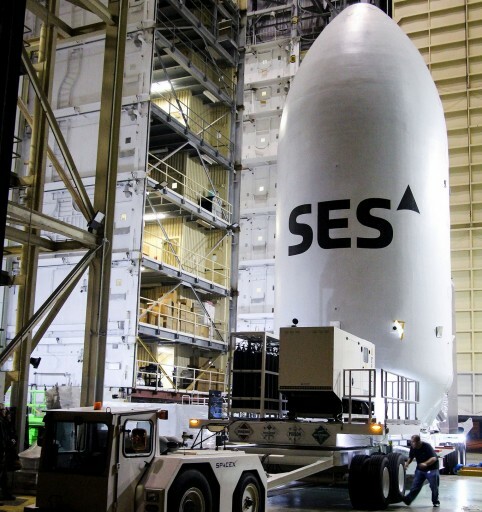 Being sent on its way, SES-9 embarked on a long mission dedicated to delivering TV and high-capacity broadband to the Asia-Pacific Region. Combining liquid and electric propulsion systems, the spacecraft will first fire its apogee engine to climb close to its operational orbit, raising the perigee and reducing the inclination before the ion thrusters take over for the final circularization and station acquisition, set to be complete by Launch +45 days. 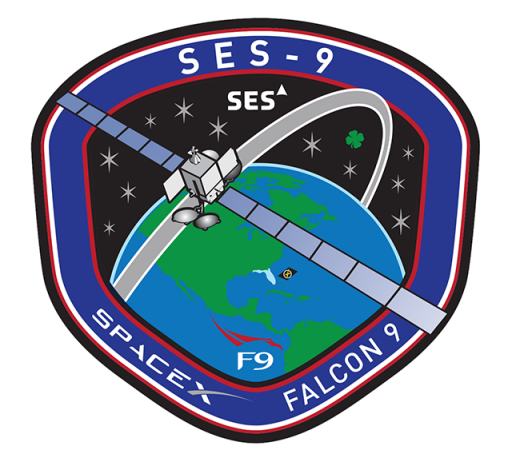 SES-9 is scheduled to begin operational services at the end of May or early in June.